The new Drop-In decoders are carefully designed to make AirWire installation as easy as possible. The Drop-Ins take advantage of the locomotive's existing wiring, connectors and lighting. Not only does the Drop-In exactly fit the inside dimensions of specific locomotives, it uses the exact same number and type of connectors, plugs and sockets to match the locomotive's internal motor, lights and smoke generator wiring. Installation has never been easier. 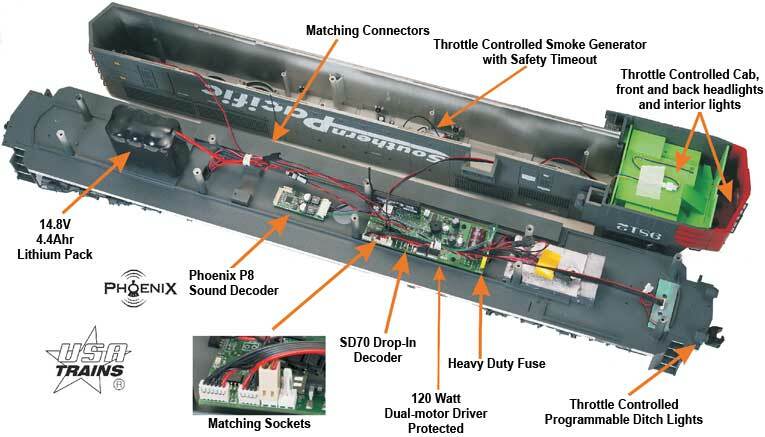 Shown below is a USA-Trains SD70 with the Drop-In installed and wired to our recommended Lithium battery pack. 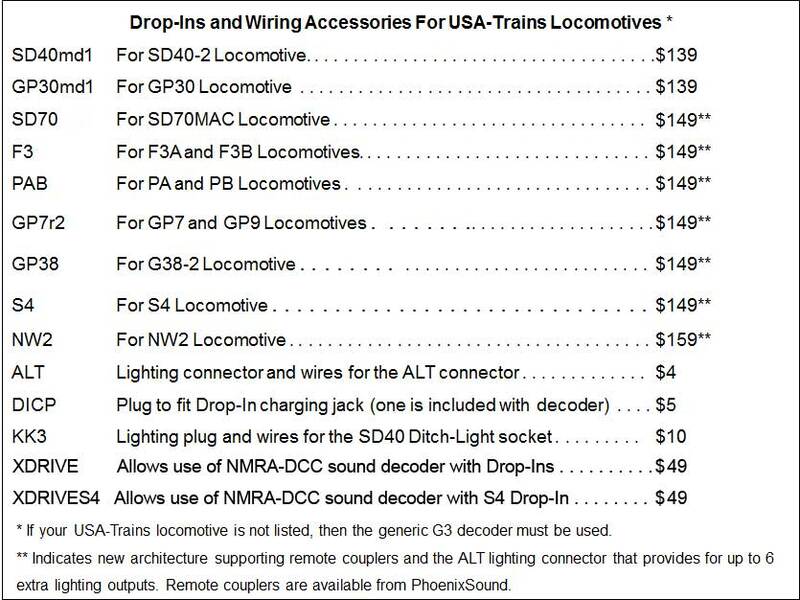 The SD70 Drop-In designed to precisely fit the USA-Trains SD70 locomotive and uses all of the original factory wiring. Only a few of the many features and capabilities are shown. For more details, download the Installation Guide and the Users Guide using the links below. To minimize file size and download time, the installation manuals are of a lower resolution than the actual printed manual that comes with each Drop-In decoder. These files are also set up for double-sided printing. If you print double sided, and then fold the resultant stack of paper in half, the booklet pages will be in the proper order. Otherwise, print single sided, cut the pages apart and put them in order using the page number shown on each page. 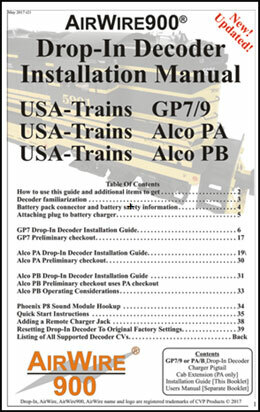 Drop-In Decoder Installation Manuals: Each unique locomotive chassis has its own installation manual. All "Drop-In" decoders are shipped with a full color, high resolution installation manual. 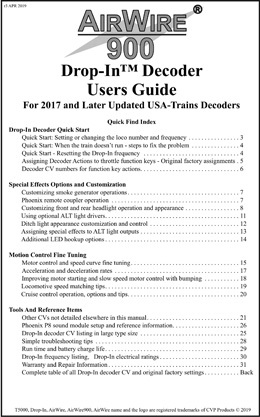 This manual is written for the current production chassis and describes how to disassemble the locomotive, and install both the Drop-In decoder and the sound decoder. If an "old style" chassis has been encountered, a specific errata sheet has been created that describes your options for using the Drop-In decoder. Usually the options involve the internal wiring for headlights and other lighting effects. If there is just a dotted box outline, there is no early production version of this locomotive. The current installation manual should be used. Click on the download button to save the manuals to your computer. The Drop-In Users Guide download file is set up for double-sided printing. If you print double sided, and then fold the resultant stack of paper in half, the booklet pages will be in the proper order. Otherwise, print single sided, cut the pages apart and put them in order using the page number shown on each page.